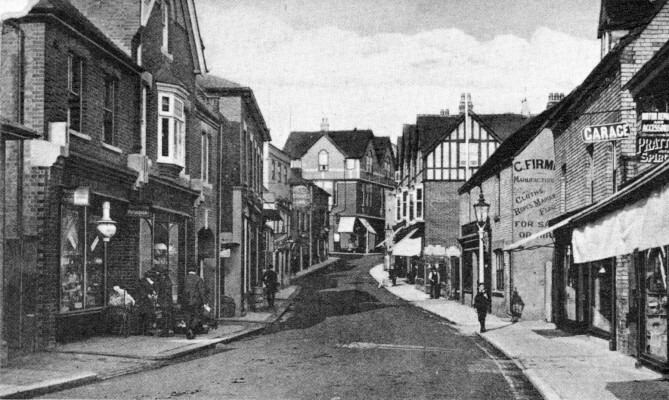 At a special sitting of the Bishop’s Stortford Bench on 28 November 1914, George Frederick Carter, a hawker, of Bishop’s Stortford was brought up in custody charged with being drunk and disorderly in South Street the previous Saturday. Supt Foster said it was South Street where the officer found him. PC Folly, temporarily stationed in Bishop’s Stortford, stated that at about 8.40 p.m. on the previous Saturday, he was on duty in South Street when his attention was called to the defendant who was shouting and “using the most obscene language he had ever heard a man use”. He took the defendant into custody with the assistance of some soldiers, as there were a number of women and children about. The defendant however continued to use bad language, a written sample of which was handed in. In reply to Mr Kent, the defendant said he knew nothing whatever about it. Pte Harry Hemsley gave corroborative evidence and said he had assisted to arrest the defendant who was mad drunk. Supt Foster stated that defendant was enrolled as a Special Constable. The defendant claimed to have been almost a teetotaller for twelve months. The defendant was further charged with assaulting Pte Hemsley at Bishop’s Stortford on the same date. Pte Hemsley deposed that at about 8.30 he, in company with Corporal Stanley, was walking along Oak Street when they passed the open door of a house from which they heard a woman shouting “Help”. They entered the building and saw defendant, who was drunk and using bad language. They got him out and asked him to be quiet but he threatened them and said he would “kill the lot, soldiers and all”. When outside, defendant deliberately kicked Pte Hemsley in the side and also in the left eye with his heel. He was mad drunk. The defendant, in reply to Mr Kent, stated that he also knew nothing whatever of this occurrence. Carter was further charged with assaulting Emma Carter at the same time. The complainant, a widow and aunt of the defendant, who appeared in court with a very discoloured eye, said that she attended to defendant’s mother who was an invalid. This she was doing on Saturday evening when the defendant came in saying he did not care for anybody and used bad language. He also said he did not care for “no aunt” and went to hit his mother but the witness stopped between and received the blow in the eye. Carter interrupted her, saying, ‘You say I went to hit my mother! I think you’ve made a mistake’. Proceeding, the witness said she called for help and had it not been for the soldiers she would not have been there that day. The witness concluded her evidence by producing a piece of paper containing a considerable quantity of hair and remarking, “there’s the hair he pulled from my head”. Carter said, ‘ All I’ve got to say is I’m very sorry. I should not have done it had I been alright. I’ve had very little beer for the past fifteen or sixteen months and don’t know how I came to get like it on Saturday’. Mr Kent said the Bench had decided to give the defendant two months’ hard labour for assaulting Pte Hemsley, two months for assaulting his aunt and one month for being drunk and disorderly; five months in all. The defendant had three counts against him and was on the Black list and when a man knocked a woman about and then said he knew nothing about it that could not be taken into consideration. He might have done serious injury to both his aunt and the soldier and the Bench would make an order that he be struck off the roll of Special Constables. Mr Kent also expressed the thanks of the Bench to the two soldiers who had assisted the police.